Around 100 delegates from 16 countries attended the UFI Conference for the Middle East and Africa in Dubai (UAE), held at the Dubai World Trade Centre on 8-9 April, making this the biggest conference that UFI has organised in the region. A mix of speakers from both inside and outside the business events industry discussed the role of smart technologies, economic outlooks and market expectations affecting our industry. Enrico Gallorini, Co-Founder of GRS Research & Strategy, delivered a strong talk about the use of SMART technologies such as the impact of artificial intelligence, virtual reality and other emerging mainstream technologies that are already in use in the exhibition environment. Leading industry players of the region shared their strategic outlooks in markets like the UAE, Bahrain, Saudi Arabia, and South Africa, focussing on the potential of collaboration to expand and grow the exhibition market throughout the region. Diana Salman, senior consultant at Human Capital Advisory – PwC UAE (UAE), discussed the ongoing economic change, which has a substantial impact on both talent management and staff retention. She explained how to identify critical talent pools for those individuals that will effect positive change and support institutional growth, and strategies on how to retain them. Paul Woodward, chairman, Paul Woodward Advisory, and Anna Holzner, managing director, Formentor, underlined the necessity for exhibition organisers to reflect changes in exhibitor needs. Eliano Marques, vice-president enterprise analytics – head of data Ssience at Emirates Group, presented how analytics can help to improve the customer experience, advancing an Emirates Airline Case Study on the matter. Sophie Holt, global strategy director at UFI research partner Explori, wrapped up the two days of sessions, breaking down the global findings of the UFI/Explori Global Visitor Insights Study for the Middle East/Africa region. She shared the drivers that make exhibitions more successful for a changing (and younger) audience, with show visitors in the region especially looking for new technology experiences, and notably more informal/street food style catering, with distinctive themes and decoration. In addition to the conference programme, there were multiple networking opportunities, including an UFI Gala dinner, and the early morning UFI Running Club. UFI members can listen to the talks and watch the presentations online via the members’ area of the UFI website (www.ufi.org). Conference participants also got to experience first-hand the World Expo site that will host more than 20m visitors in 2020 and 2021. 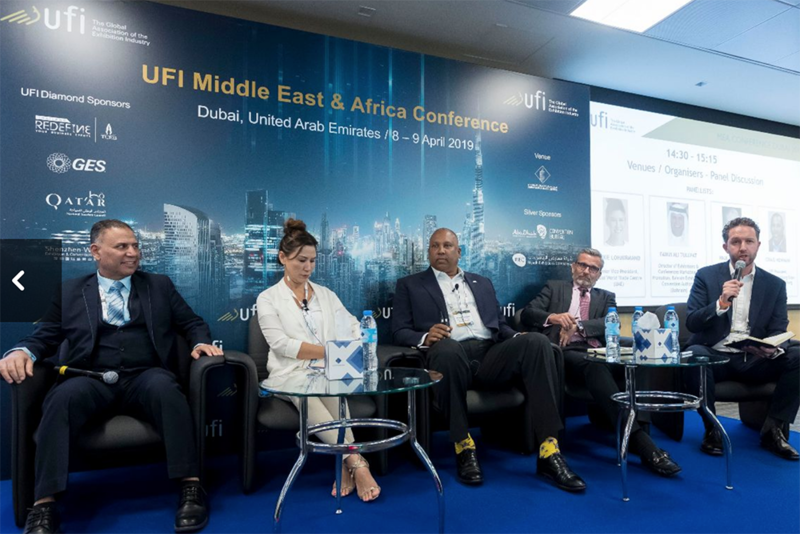 For the first time ever, key figures for the Middle East and Africa region from UFI’s groundbreaking new research on the economic impact of exhibitions were shared during the UFI chapter meeting that took place before the start of the conference. These figures were an advance preview of UFI’s comprehensive global Economic Impact Study, conducted by Oxford Economics that will be released later this month. The Middle East region currently sells 3m sqm of exhibition space and hosts 125,000 exhibiting companies. Africa hosts more than 40,000 exhibiting companies whilst welcoming 2.15m trade show visitors. UFI first opened an office in the region back in 2006. Nick Savage currently manages the office that is now based in Dubai. This year’s conference was supported by UFI’s Diamond Sponsors: The Thailand Convention & Exhibition Bureau (TCEB), Global Experience Specialists (GES), Qatar National Tourism Council (Qatar) and Shenzhen World. Photo: Venues / Organisers – Panel Discussion, from left: Fawzi Ali Tulefat, Director of Exhibitions & Conferences Marketing & Promotion, Bahrain Exhibition & Convention Authority (Bahrain), Trixie LohMirmand, Senior Vice-President, Dubai World Trade Centre (UAE), Craig Newman, UFI President, CEO, Johannesburg Expo Centre Johannesburg (South Africa), Paul Grinnall, COO, Riyadh Exhibitions Company Ltd. (Saudi Arabia) and Chris Kilbee, SVP Construction, dmg::events (UAE). Martin Fullard: journalist, presenter, producer. 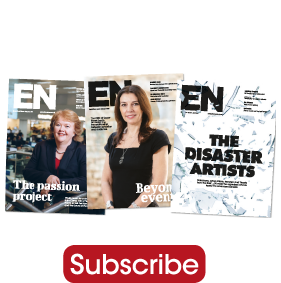 Martin is the Deputy Editor at Conference News and Conference & Meetings World magazines. He leads the digital channels on Mash Media’s Conference Division as well as heading up Mash TV. He is formerly a web editor at a national newspaper in the Middle East and motoring journalist.